Black First Land First (BLF) members attempted to enter a Daily Maverick event hosted at the Cape Town International Convention Centre on Thursday, but were stopped by security. 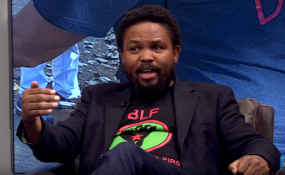 BLF leader Andile Mngxitama made an appearance at Daily Maverick's "The Gathering" event, hosted by the news website, despite a court order interdicting the group from continuing to harass members of the media. Mngxitama was stopped by security at the entrance of the venue. He then made a speech from beyond the ropes to the gathered crowd. "You are not giving us a right to reply. We are here to engage in a civil manner with Daily Maverick and amaBhungane, who are lying, and generating fake news," Mngxitama claimed from beyond the ropes, flat white coffee in hand. He accused those barring them from the event of being "fascists", and demanded his money back from security personnel, who did not budge. BLF members continued their impromptu speech from beyond the ropes, but it eventually fizzled out. Mngxitama and other leaders were then seen engaging with event organisers and security from a distance. The event continued unchecked inside, where businesspeople Sipho Pityana and Wendy Applebaum were part of a panel discussing business' responsibility in media and politics. Approximately six members of the SAPS arrived on the scene. BLF's attempts seemed to completely die down, and the scene was calm, but they were still demanding their money back. Mngxitama and a small band of BLF members disrupted a discussion on state capture in Braamfontein, Johannesburg last week. The South African National Editors Forum (Sanef), amaBhungane managing partner Sam Sole and HuffPost SA editor-at-large Ferial Haffajee on Tuesday launched an urgent application in the High Court in Pretoria to convict Mngxitama for contempt of court, following repeated attempts at disrupting events. BLF and its leaders were interdicted by the High Court in Johannesburg on July 7 from intimidating and assaulting journalists, and going to journalists' homes.